Recipe Box | What's Eating You? 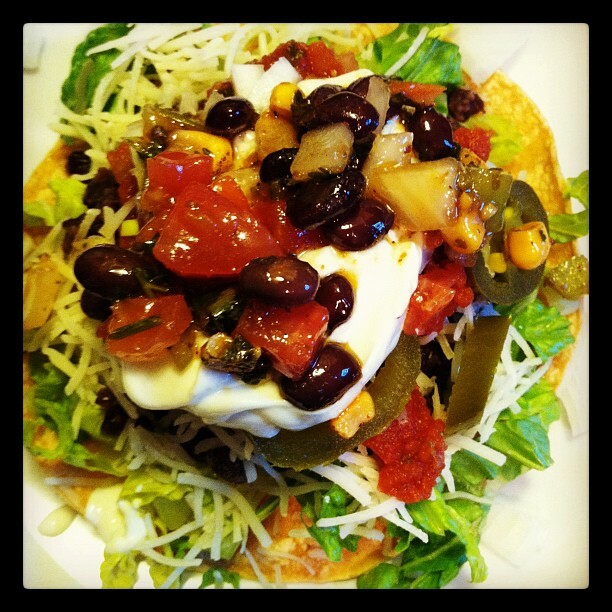 This is my basic black bean recipe. Sort beans then rinse them really well with cold water. Place beans, drained, in cold crockpot and pour in fresh, filtered water. Let sit overnight. The next morning, rinse beans again. and then place back into crockpot, add enough fresh filtered water to cover (if you really want to pack a punch use veggie broth in place of cooking water). Add spices, herbs, and garlic. Cook on high for 2 – 3 hours, then turn to low and let cook for another 3 – 4 hours. Then they are ready to go! I drain them a little to store in glass containers in fridge (unless I’m making black bean soup). 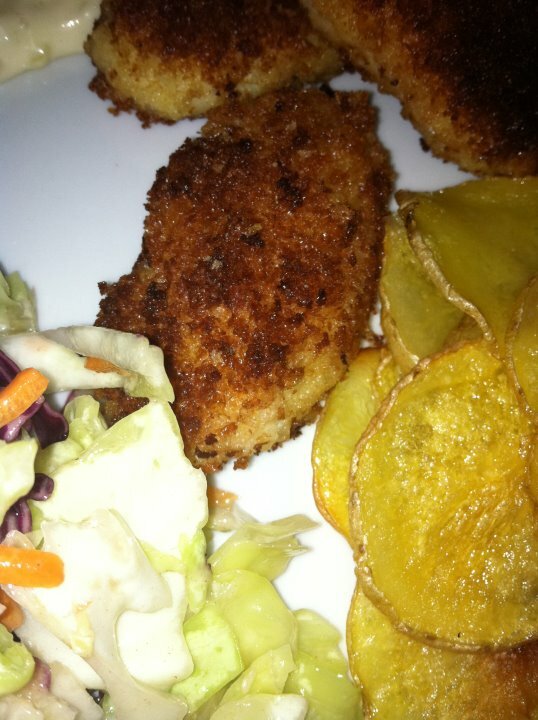 Posted by Kim in Recipe Box, What's Eating You? Summer is so bountiful – so many delicious fruits and veggies. I have been a fruit lover since I was a kid. They appeal to my sweet tooth! Grilled Peaches topped with vanilla ice cream is ridiculously easy to make and so delicious you will not believe they fit into your eating plan. This runs about 150 calories for one serving but, honestly, 1/2 a serving is plenty for me. Pre-heat your grill – if you use charcoal the coals need to be at the white ash stage – if you don’t have a grill, use a cast iron grill pan and pre-heat. Wash peaches and dry. Cut in half and take out the pit. Scrape the area where the pit was with a spoon to scoop out that pity part of the peach. Sprinkle, with a VERY light hand, cinnamon, over the cut side. Place on grill, cut side down. You may need to use some kind of oil on your grill pan (coconut or grapeseed would be good) – I didn’t use any on my grill. Let cook for a good 3-4 mins. Just keep an eye on them. You don’t want the heat so high that they burn but you don’t want it so low that it just cooks away the juices. The idea is to carmelize the sugars a little bit. Flip the peaches onto the skin side and let cook another 3-4 mins. Note how peach juice pools at the center of the peach? When the peaches are ready to pull off the grill, pick them up with tongs and if possible pour the remaining peach juice into a tiny ramekin and place the peaches on a platter to rest for a few minutes. If you don’t like the skin on, it’s easily peeled off. Though I prefer to plate them as a whole half peach, they are a lot easier to eat if you cut into bite size pieces. Top each half with 1 tablespoon of vanilla ice cream and drizzle a bit of the reserved peach juice over the ice cream. Serve immediately after topping with ice cream (it’s going to melt fast!). 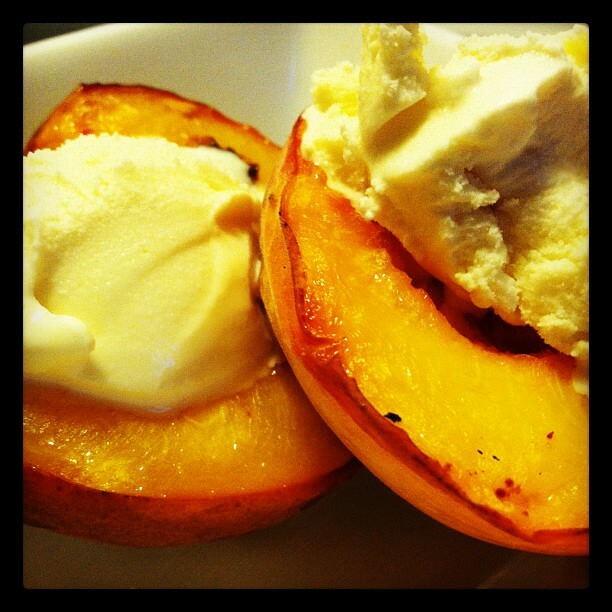 Each peach half with 1 tbsp ice cream runs about 75 calories (depending on what kind of ice cream you use). They are delicious without any topping. You could chop up a few candied pecans and sprinkle over the top of the ice cream. 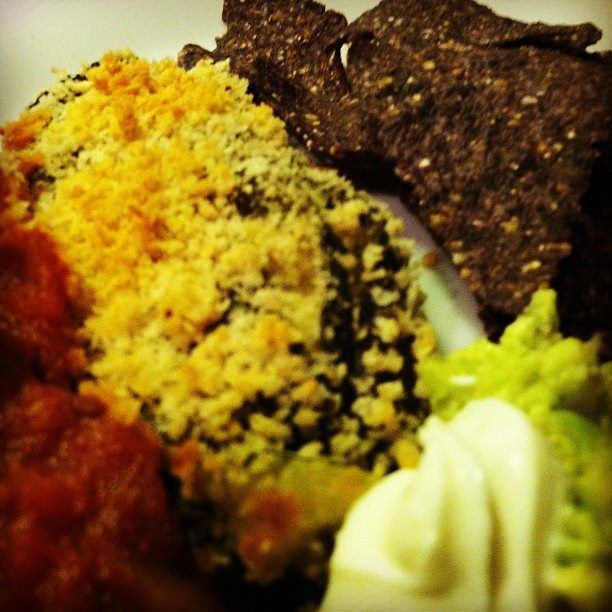 Jillian Michaels has a great recipe for Quinoa Crunch that would be so good sprinkled on this. Add a spring of fresh mint or stevia for presentation. This is definitely an “open a can of this and dump that in there” recipe. It’s my go to meal when I am hungry and don’t feel like cooking. I always keep the basics to make this in my pantry. Olive oil in heated saute pan, add onion and stir until cooked (translucent). In the meantime, open the can of lentils, drain in collander, and rinse with fresh water until water runs clear off beans. Shake collander to get out as much water as you can. When onions are cooked, and salt and pepper onions, and add garlic. Let simmer for 1 mins – don’t let the garlic burn or it will be bitter. Add lentils. Stir and let any remaining water cook off. About 2 mins. Open jar of simmer sauce and pour into pan. Add a 1/4 cup fresh filtered water to jar, replace lid and shake, dump the rest of the sauce in the pan. Stir. Let simmer until cooked through and bubbly. I serve 1/4 of the beans over 1/2 cup of rice. I top with something cooling like feta cheese (1.2 ounce) or 1/2 tbsp plain greek yogurt (tastes like sour cream). If you want, you could serve with a fresh pita and hummus. 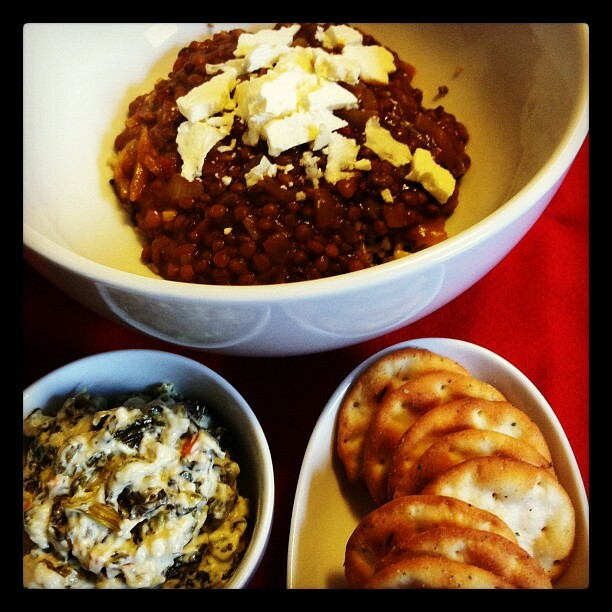 In the photo above, I’ve topped with feta and served with pita chips and Trader Joes spinach, kale and yogurt dip. Ingredients: Make them all organic – seriously, nothing that’s going into this salad should be conventional because it really is that easy and as cheap to eat better in this instance. AND all this stuff is in season right now. Bring a pot of water to a boil and add broccoli for 2 mins. Use a slotted spoon to lift out of pot and place into an ice bath (this is perfectly blanched broccoli). 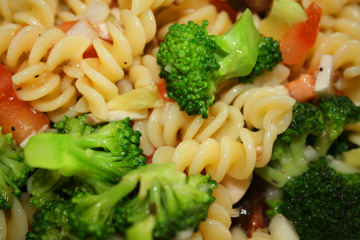 Add pasta to boiling broccoli water. Stir and add a pinch of salt if you want. When pasta is al dente, drain and let cool a little bit, then add to the bowl of chopped veg – drizzle on some dressing or olive oil – don’t go crazy, a little goes a long way. Add a few tablespoons, then stir it up and then add more if you need it. Et voila, simple pasta salad. Serve a cup on top of some mixed organic baby greens. Toss on some crumbled feta or shredded chicken for some clean protein. This is super easy to make and you really can make it your own. Try different pastas – shapes and flavors. Try different veggies – get what’s in season and local if possible. I should have added some blanched asparagus to this because it’s so abundant right now. Try different herbs – I tend to go fresh since I grow them but if you have a good dried herb, use it! My pasta salad usually tastes better after it’s had a chance to marinate. Will keep well in fridge, covered, for 4 days. Want a delicious treat? Dip fruit in melted chocolate – it’s relatively low in calories and you get the benefit of eating fresh fruit! I made two things today. 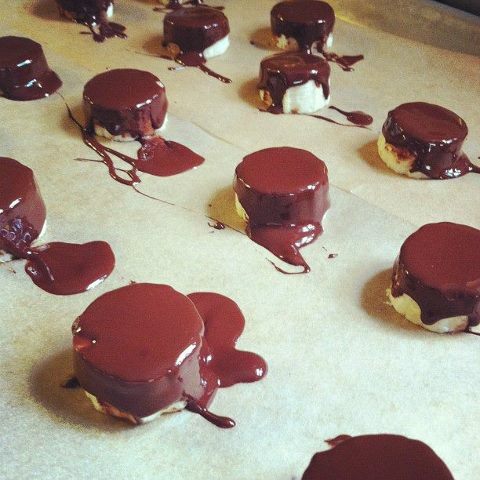 Chocolate covered strawberries and banana bon-bons. Both are so light but taste so decadent. 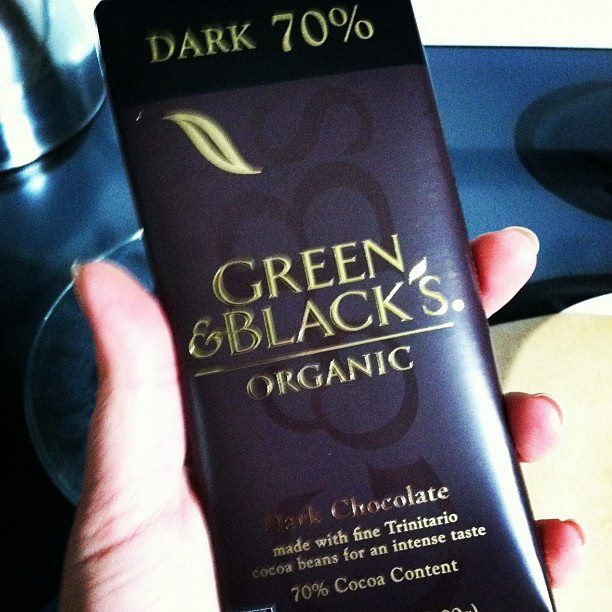 Get yourself some good organic dark chocolate and some fresh organic fruit. Break the chocolate in to little pieces and place in a microwave safe glass bowl (or if you are leery of using a microwave, melt the chocolate in a double boiler – you can mimic one by filling a pot with water and placing a glass bowl on top, bring to a low boil and keep an eye on the chocolate). Prep your fruit and work surface. 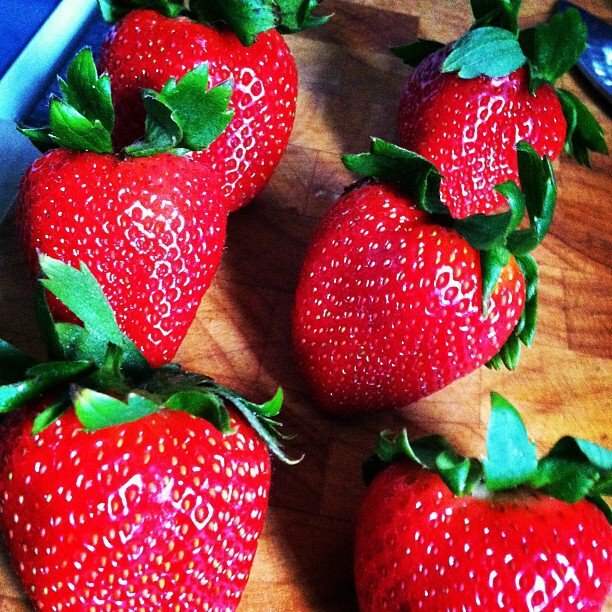 Wash the strawberries and dry with a paper towel. Peel the banana and chop into 1/2″ pieces. Place a piece of parchment paper on a flat surface (like a plate) and place another piece of parchment on a baking sheet. 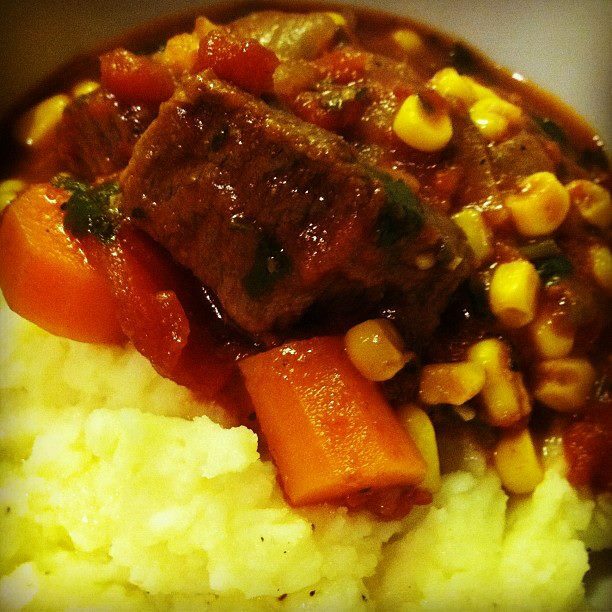 If you microwave, do it in 20 second intervals – take out and stir each time. It won’t take long to melt – maybe a minute or so. Working quickly, dip the strawberries into the chocolate one at a time and place on the parchment covered plate. Set aside. Now do the same for the banana and place on the parchment covered baking sheet chocolate side up. When you’re done place the baking sheet of bananas in the freezer for about an hour. Serve immediately or store in a freezer bag. You can eat the strawberries when the chocolate hardens. Store in the fridge if you must. I try to only make enough to eat that day/night. To make Chiles Rellenos: Roast and peel chiles. Cut 3-inch slit in each chile, and remove seeds with spoon. Preheat oven to 425°F. Heat oil in skillet over medium heat. Add onion, and cook 5 minutes, or until soft. Add zucchini and corn, and cook 5 minutes more. Season with salt, if desired. Transfer to bowl, and stir in cheese. Stuff each chile with 1/2 cup zucchini mixture. Secure closed with toothpicks. Whisk egg with 1/2 cup water in bowl. Spread breadcrumbs on plate. Dip chiles in egg wash. Coat with breadcrumbs. Place on baking sheet, and bake 15 to 25 minutes, or until golden. To make Sauce: Heat oil in saucepan over medium heat. 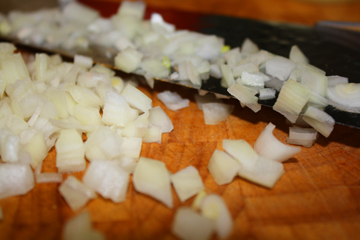 Add onion, chili powder, and cumin, and cook 4 to 5 minutes, or until onion is soft and spices are fragrant. Add tomatoes, and simmer 10 minutes, breaking up tomatoes with spatula or wooden spoon. Transfer to blender, add chipotle chile, and blend on low speed until Sauce is smooth. Serve Chiles Rellenos with Sauce, cilantro, lime wedges and sour cream. This recipe was inspired by my brother – he sent me his recipe and I just substituted some ingredients because I had it in the pantry and thought it would be a good add. Per usual, I use organic and/or local ingredients whenever possible. Preheat oven to 300F. Spray rimmed baking sheet with nonstick spray or line the sheet with parchment paper. Mix oats, almonds, brown sugar, quinoa, flaxseed, cinnamon, and nutmeg in large bowl. Bring OJ, oil, and syrup to a boil in small saucepan. Turn off and stir in vanilla. Drizzle OJ mixture over dry ingredients; toss to coat. 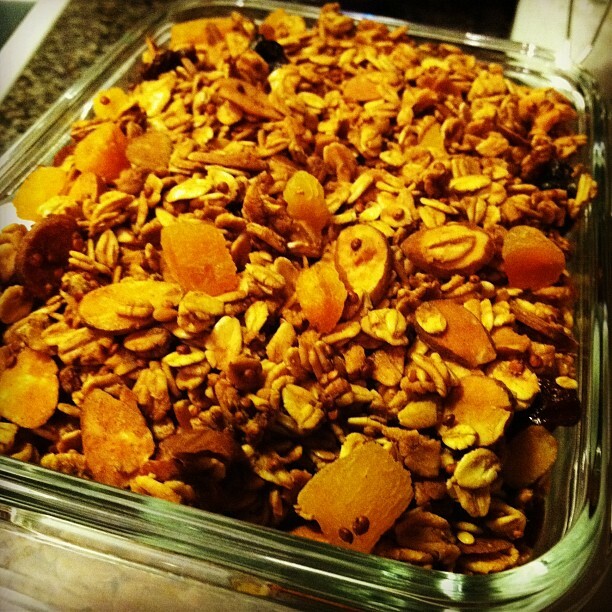 Spread granola evenly on baking sheet. 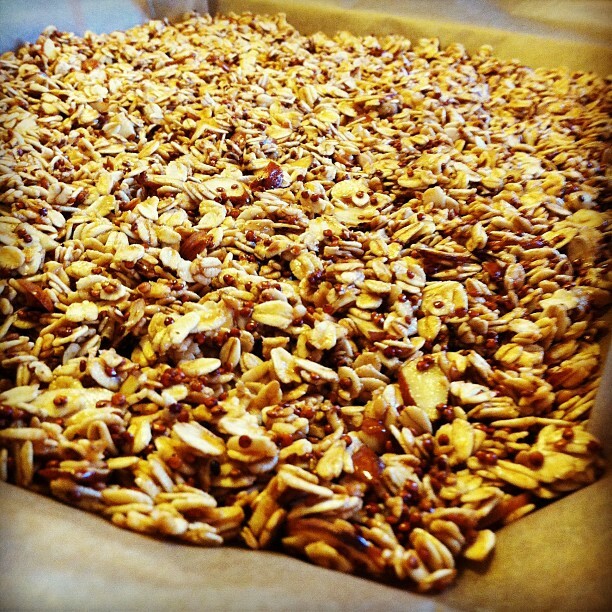 Bake granola until golden brown, stirring occasionally, about 50 minutes. Divide fruit between sheets and toss to coat; bake granola 10 minutes longer. Let cool and store in an airtight container. If you don’t eat it up because it tastes so freaking good, it should last about a week. I found this recipe at least 3 years ago…it was in a Weight Watchers magazine. I wrote it down and saved the recipe – which is a good thing because it’s a hard one to find online. I really don’t remember what the points values or even the nutrition information – sorry! But I know you can eat a big bowl of this without going over your calories – I think it’s somewhere around 400 cals with the potatoes. Sprinkle the beef with the salt and pepper. Spray a dutch oven with nonstick spray. Sear the beef, in batches, over medium-high heat until browned, about 3 minutes. Transfer each batch to a plate. Add the next 6 ingredients and cook until golden. Stir in the beef, tomatoes, and bay leaf. Bring to a boil. Simmer, covered, until beef is tender, 1 ½ hours. Cut 1 ear of corn crosswise into 1-inch pieces. Remove the kernels from the remaining cob. Add all the corn to the stew and cook 10 minutes. Stir in the cilantro and vinegar. Discard the bay leaf. Bring to a boil in a large saucepan the potatoes and enough cold salted water to cover. Reduce the heat and simmer until the potatoes are tender, about 10 minutes. Drain well and return to pan. Using a mixer, mix in the buttermilk, chipotles, salt and pepper until well blended. Okay, disclaimer – of course, this is NOT authentic. I’m a woman who was born and raised in the deep South. I have never even been to Vietnam. This is a recipe I found on the back of the Pacific Natural Foods box of pho base. It is so easy to make and so good. This can easily be a staple for me as there are so many variations. Nutrients Per Serving: 400 calories, 2g Fat, 33.9 g Protein, 57.4 Carbs, AND ridiculous amounts of sodium — yikes, just figured this out! 🙂 I have calculated 1455mg sodium. 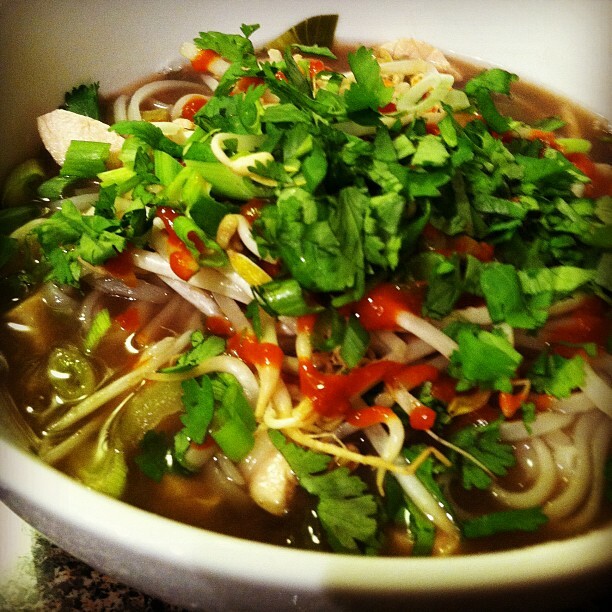 Will have to see how to get that down (it’s from the pho base). Time saver tip: just buy the pre-prepped slaw mix…they have all kinds of varieties and many organic ones as well. one: preheat oven to 350°F. Line a baking sheet with parchment paper and set aside. In a food processor, process bread into crumbs. Set aside. two: slice potatoes as thinly as possible. 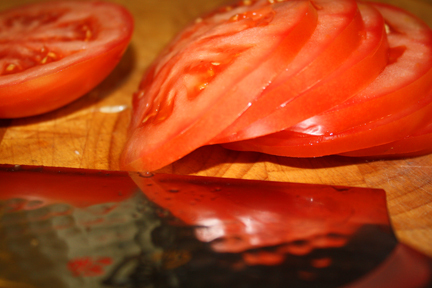 Spread slices out evenly on baking sheet and drizzle with 1 1/2 tsp oil. Sprinkle salt over top and use fingertips to rub oil and salt onto each slice. Bake for 20 mins. or until golden brown. As soon as potatoes come out of oven, sprinkle with dill and lightly toss to combine. three: prepare slaw: In a large bowl, mix cabbage, carrot, radishes and apple. In a small bowl, whisk together vinegar, mustard and 1 tbsp oil. Toss with cabbage mixture. (The first time I made this recipe, I made the slaw like that. Next time it will be with a good pre-prepped slaw mix – I’ll still use the same amount and toss with the vinegar, mustard and oil). four: prepare fish sticks. Crack egg into a medium bowl. Chop fish as finely as possible and add to egg. Add 1/4 cup bread crumbs (I use panko) to tilapia mixture, then use hands to thoroughly combine. five: divide fish mixture into 8 equal portions, shaping each into a rectangular stick about 2 1/2 inches long. Pour another 1/4 cup bread crumbs into a large or flat-bottomed soup bowl. Dredge each stick in bread crumbs, pressing lightly to coat both sides. six: heat remaining 1 1/2 tsp oil in a large nonstick skillet for 1 min on medium. Add fish sticks to pan and cook, covered, for 4 minutes or until bottoms are golden brown. Use heatproof tongs to gently flip sticks over and cook for another 3 minutes or until both sides are golden brown. Serve with potato chips and slaw.